Posted by geoconger in Church of England Newspaper, Church of the Province of West Africa. The Bishop of Liberia writes that his predecessor, the Rt. Rev. Edward W. Neufville II died on Jan 10, 2011 after a brief illness at the Medical University of South Carolina in Charleston. He was 74. Elected bishop of the West African diocese in 1995, Bishop Neufville returned from exile in the US to Liberia to take up his post at the close of the six year civil war that killed over 150,000 people and drove over 750,000 people out of a population of 2.6 million into exile. Much of the diocese’s infrastructure and property was destroyed in the violence and its clergy and people scattered by the war. Founded by American missionaries in the 1840’s, the Diocese of Liberia was a part of the US Episcopal Church until 1982, when it transferred to the Province of West Africa. While the diocese provided leadership in the form of Archbishop George Browne for the Church of West Africa, the weakening of financial ties with the Episcopal Church came shortly before the start of the civil wars that all but destroyed the country. The church-affiliated Cuttington College, West Africa’s oldest university and the diocese’s theological school, was wrecked in the fighting after one of the rebel armies used its facilities as a base camp. Bishop Neufville’s episcopate was dedicated to rebuilding both Liberia and the Episcopal Church in the wake of the civil wars. Educated at Cuttington College, Bishop Neufville served as priest of St. Martin on the Mountain in Yekepa, Nimba County, and was appointed archdeacon of the church’s Northern Archdeaconry, serving Bong, Lofa and Nimba Counties. 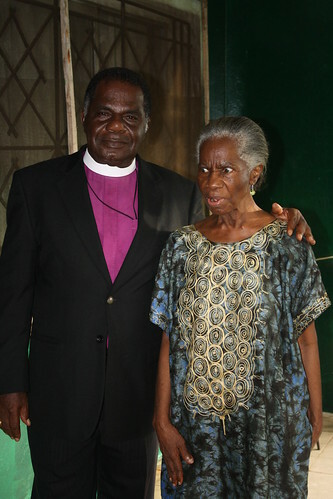 Elected suffragan bishop in 1980, then bishop in 1995, Bishop Neufville retired in 2007 upon reaching his 70th birthday. Great Man Of God!! Gave new meaning to servanthood.